For other uses, see Ezra (disambiguation). Ezra (/ˈɛzrə/; Hebrew: עזרא‎‎, Ezra; fl. 480–440 BCE), also called Ezra the Scribe (עזרא הסופר, Ezra ha-Sofer) and Ezra the Priest in the Book of Ezra, was a Jewish scribe and a priest. According to the Hebrew Bible he returned from the Babylonian exile and reintroduced the Torah in Jerusalem (Ezra 7–10 and Neh 8). According to 1 Esdras, a Greek translation of the Book of Ezra still in use in Eastern Orthodoxy, he was also a high priest. Rabbinic tradition holds that he was only a common priest. Ezra, known as "Ezra the scribe" in Chazalic literature, is a highly respected figure in Judaism. The canonical Book of Ezra and Book of Nehemiah are the oldest sources for the activity of Ezra, whereas many of the other books ascribed to Ezra (First Esdras, 3-6 Ezra) are later literary works dependent on the canonical books of Ezra and Nehemiah. The books of Ezra–Nehemiah were originally one scroll. (Nehemiah 3:32, footnote) Later the Jews divided this scroll and called it First and Second Ezra. Modern Hebrew Bibles call the two books Ezra and Nehemiah, as do other modern Bible translations. A few parts of the Book of Ezra (4:8 to 6:18 and 7:12-26) were written in Aramaic, and the majority in Hebrew, Ezra himself being skilled in both languages. Ezra, a descendant of Seraiah the high priest, was living in Babylon when in the seventh year (c. 457 BCE) of Artaxerxes, king of Persia, the king sent him to Jerusalem to teach the laws of God to any who did not know them. Ezra led a large body of exiles back to Jerusalem, where he discovered that Jewish men had been marrying non-Jewish women. He tore his garments in despair and confessed the sins of Israel before God, then braved the opposition of some of his own countrymen to purify the community by enforcing the dissolution of the sinful marriages. Some years later Artaxerxes sent Nehemiah (a Jewish noble in his personal service) to Jerusalem as governor with the task of rebuilding the city walls. Once this task was completed Nehemiah had Ezra read the Law of Moses (the Torah) to the assembled Israelites, and the people and priests entered into a covenant to keep the law and separate themselves from all other peoples. 1 Esdras, probably from the late 2nd/early 1st centuries BCE, preserves a Greek text of Ezra and a part of Nehemiah distinctly different from that of Ezra–Nehemiah – in particular it eliminates Nehemiah from the story and gives some of his deeds to Ezra, as well as telling events in a different order. Scholars are divided on whether it is based on Ezra–Nehemiah, or reflects an earlier literary stage before the combination of Ezra and Nehemiah accounts. The first-century Jewish historian, Josephus, deals with Ezra in his Antiquities of the Jews. He preferred 1 Esdras over the canonical Ezra–Nehemiah and placed Ezra as a contemporary of Xerxes, son of Darius – rather than of Artaxerxes. The apocalyptic fourth book of Ezra (also called the second book of Esdras) was written c.AD 100, probably in Hebrew-Aramaic. It was one of the most important sources for Jewish theology at the end of the 1st century. In this book, Ezra has a seven part prophetic revelation, converses with an angel or God three times and has four visions. Ezra, thirty years into the Babylonian Exile (4 Ezra 3:1 / 2 Esdras 1:1), recounts the siege of Jerusalem and the destruction of Solomon's Temple. This would place these revelations in the year 557 BCE, a full century before the date given in the canonical Ezra. The central theological themes are "the question of theodicy, God's justness in the face of the triumph of the heathens over the pious, the course of world history in terms of the teaching of the four kingdoms, the function of the law, the eschatological judgment, the appearance on Earth of the heavenly Jerusalem, the Messianic Period, at the end of which the Messiah will die, the end of this world and the coming of the next, and the Last Judgment." 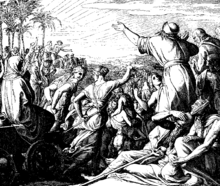 Ezra restores the law that was destroyed with the burning of the Temple in Jerusalem. He dictates 24 books for the public (i.e. the Hebrew Bible) and another 70 for the wise alone (70 unnamed revelatory works). At the end, he is taken up to heaven like Enoch and Elijah. Ezra is seen as a new Moses in this book. There is also another work, thought to be influenced by this one, known as the Greek Apocalypse of Ezra. Woodcut for Die Bibel in Bildern, 1860, by Julius Schnorr von Carolsfeld. Traditionally Judaism credits Ezra with establishing the Great Assembly of scholars and prophets, the forerunner of the Sanhedrin, as the authority on matters of religious law. The Great Assembly is credited with establishing numerous features of contemporary traditional Judaism in something like their present form, including Torah reading, the Amidah, and celebration of the feast of Purim. In Rabbinic traditions, Ezra is metaphorically referred to as the "flowers that appear on the earth" signifying the springtime in the national history of Judaism. A disciple of Baruch ben Neriah, he favored study of the Law over the reconstruction of the Temple and thus because of his studies, he did not join the first party returning to Jerusalem in the reign of Cyrus. According to another opinion, he did not join the first party so as not to compete, even involuntarily, with Jeshua ben Jozadak for the office of chief priest. According to Jewish tradition, Ezra was the writer of the Books of Chronicles, and is the same prophet known also as Malachi. There is a slight controversy within rabbinic sources as to whether or not Ezra had served as Kohen Gadol. According to the Babylonian Talmud, Ezra the scribe is said to have enacted ten standing laws and orders, which are as follows: 1) That the public come together to read from the scroll of the Law on Sabbath days during the time of the afternoon oblation (Minchah), because of those travelling merchants who loiter in the closed shops in the street corners, and who may have missed the biblical lections that were read during the weekdays; 2) that the courts be opened throughout the Jewish townships on Mondays and Thursdays; 3) that women do not wait beyond Thursday to launder their clothes, because of the honor due to the Sabbath day; 4) that men would accustom themselves to eat [cooked] garlic on the eve of the Sabbath (believed to enhance love between a man and his wife); 5) that women would rise-up early on Friday mornings to bake bread, so that a piece of bread will be available for the poor; 6) that Jewish women in every place be girded with a wide belt (waist band), whether from the front or from behind, out of modesty; 7) that Jewish women, during their menses, wash and comb their hair three days prior to their purification in a ritual bath; 8) that the travelling merchants make regular rounds into the Jewish townships because of the honor due to the daughters of Israel; 9) that Jewish women and/or girls, as a precautionary measure, be accustomed to conversing with one another while one of their party goes out to relieve herself in the outhouse; 10) that men who may have suffered a seminal emission (especially after accompanying with their wives) be required to immerse themselves in a ritual bath before being permitted to read from the scroll of the Law. In the Syrian village of Tedef, a synagogue said to be the place where Ezra stopped over has been venerated by Jews for centuries. Another tradition locates his tomb near Basra, Iraq. Early Christian writers occasionally cited Ezra as author of the apocalyptic books attributed to him. Clement of Alexandria in his Stromata referred to Ezra as an example of prophetic inspiration, quoting a section from 2 Esdras. In Islam he is known as Uzair (عُزَيْرٌ). He was mentioned in the Qur'an. Although he was not mentioned as one of the Prophets of Islam, he is considered as one of them by some Muslim scholars, based on Islamic traditions. His tomb at Al-ʻUzair on the banks of the Tigris near Basra, Iraq, is a pilgrimage site for the local Marsh Arabs. Many Islamic scholars and modern Western academics do not view Uzair as "Ezra"; for example Professor Gordon Darnell Newby associates Uzair with Enoch and Metatron. On this Timothy Winter (Abdal Hakim Murad) and Gordon Darnell Newby associate Uzair again with Enoch (ancestor of Noah) and by extension Metatron the creator-angel or "lesser Yahweh". Mary Joan Winn Leith in The Oxford History of the Biblical World believes that Ezra was a historical figure whose life was enhanced in the scripture and given a theological buildup. Gosta W. Ahlstrom argues the inconsistencies of the biblical tradition are insufficient to say that Ezra, with his central position as the 'father of Judaism' in the Jewish tradition, has been a later literary invention. 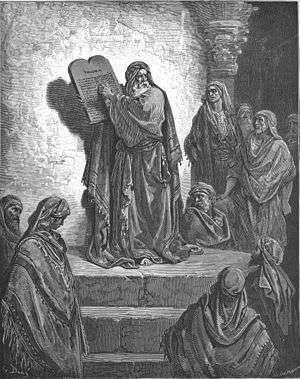 Those who argue against the historicity of Ezra argue that the presentation style of Ezra as a leader and lawgiver resembles that of Moses. There are also similarities between Ezra the priest-scribe (but not high priest) and Nehemiah the secular governor on the one hand and Joshua and Zerubbabel on the other hand. The early 2nd-century BCE Jewish author Ben Sira praises Nehemiah, but makes no mention of Ezra. Richard Friedman argued in his book "Who Wrote the Bible?" (p. 232 1997 edition) that Ezra is the one who redacted the Torah, and in fact effectively produced the first Torah. It has been argued that even if one does not accept the documentary hypothesis, Ezra was instrumental in the start of the process of bringing the Torah together. Scholars are divided over the chronological sequence of the activities of Ezra and Nehemiah. Ezra came to Jerusalem "in the seventh year of Artaxerxes the King". The text does not specify whether the king in the passage refers to Artaxerxes I (465-424 BCE) or to Artaxerxes II (404-359 BCE). Most scholars hold that Ezra lived during the rule of Artaxerxes I, though some have difficulties with this assumption: Nehemiah and Ezra "seem to have no knowledge of each other; their missions do not overlap", however, in Nehemiah 12, both are leading processions on the wall as part of the wall dedication ceremony. So, they clearly were contemporaries working together in Jerusalem at the time the wall and the city of Jerusalem was rebuilt in contrast to the previously stated viewpoint.;." These difficulties have led many scholars to assume that Ezra arrived in the seventh year of the rule of Artaxerxes II, i.e. some 50 years after Nehemiah. This assumption would imply that the biblical account is not chronological. The last group of scholars regard "the seventh year" as a scribal error and hold that the two men were contemporaries. ↑ Tawil, Hayim & Schneider, Bernard 2010, Crown of Aleppo: The Mystery of the Oldest Hebrew Bible Codex, Philadelphia, Jewish Publication Society 2010, p. 63 ISBN 9780827608955; Laniado, David, Li-Qedošim ašer ba-areṣ, Jerusalem 1980, p. 26 (Hebrew); Frenkel, Miriam, article: Atare pulḥan yehudiyyim be-ḥalab bi-yme ha-benayim ha-tikhoniyyim, published in: Harel (הראל), Yaron, Assis, Yom Ṭov & Frenkel, Miriam (eds. ), Ereṣ u-mlo’ah: meḥqarim be-toledot qehillat aram ṣova (ḥalab) ve-tarbutah, vol. I, Ben-Zvi Institute: Jerusalem 2009, pp. 174 – 175 (Hebrew); Khatib, Muḥammad Zuhair, Rabṭ al-Sabāba al-yamanī. 1 2 3 4 5 Liwak, Rüdiger; Schwemer, Anna Maria "Ezra." Brill's New Pauly. 1 2 3 4 Ezra." Encyclopædia Britannica.2007. Encyclopædia Britannica Online. ↑ Introduction to the Aramaic Targum of Yonathan ben Uzziel on the Prophet Malachi (Minor Prophets); Yehoshua b. Ḳarḥa (Megillah 15a) . ↑ The Apocryphal Apocalypse: the reception of the second book of Esdras Alastair Hamilton – 1999 p22 "that were part of the canon.13 Although Clement of Alexandria, who was writing in the late second and early third century, showed more interest in 1 Esdras, he cited 2 Esdras in his Stromata, referring to Esdras as an example of prophetic inspiration..."
↑ But the Qur'an 9:30 quotes Jews as saying that he is the "son of God" Ashraf, Shahid (2005). "Prophets 'Uzair, Zakariya and Yahya". Encyclopaedia of Holy Prophet and Companions (Google Books). Daryaganj, New Delhi: Anmol Publications Pvt. Ltd. pp. 199–200. ISBN 81-261-1940-3. Retrieved 20 November 2007. ↑ Ibn Kathir. "`Uzair (Ezra)". Stories Of The Quran. Ali As-Sayed Al-Halawani (trans). Islambasics.com. Retrieved 21 November 2007. 1 2 Winn Leith, Mary Joan (2001) . "Israel among the Nations: The Persian Period". In Michael David Coogan (ed.). The Oxford History of the Biblical World (Google Books). Oxford; New York: Oxford University Press. p. 306. ISBN 0-19-513937-2. LCCN 98016042. OCLC 44650958. Retrieved 13 December 2007. ↑ Porter, J.R. (2000). The Illustrated Guide to the Bible. New York: Barnes & Noble Books. pp. 115–116. ISBN 0-7607-2278-1. ↑ Winn Leith, Mary Joan (2001) . "Israel among the Nations: The Persian Period". In Michael David Coogan (ed.). The Oxford History of the Biblical World (Google Books). Oxford; New York: Oxford University Press. p. 281. ISBN 0-19-513937-2. LCCN 98016042. OCLC 44650958. Retrieved 13 December 2007. Bossman, D. (1979). "Ezra's Marriage Reform: Israel Redefined". Biblical Theology Bulletin. 9: 32–38. doi:10.1177/014610797900900105. Bright, John (1981). A history of Israel (3rd ed.). Philadelphia: Westminster Press. ISBN 0-664-21381-2. Fensham, F. Charles (1983). The books of Ezra and Nehemiah. Grand Rapids, MI: W.B. Eerdmans Publishing Company. ISBN 0-8028-2362-9. LaSor, William Sanford; Hubbard, David Allan; Bush, Frederick William (1982). Old Testament survey. Grand Rapids, Mich.: Eerdmans. ISBN 0-8028-3556-2. Williamson, H.G.M. (1987). Ezra and Nehemiah. Sheffield: JSOT for the Society for Old Testament Study. ISBN 1-85075-045-9. Wikimedia Commons has media related to Ezra.